No need to wonder anymore if the shoes you like is available in small size. If you were size 33, 34, 35 or 36, you can enjoy your shopping mindfree ! Discover our selection of small size women shoes. A selection of modern, feminine, elegante and comfortable styles Made in Spain and Italy. A wide selection of pumps, sandals, flat shoes, boots and wedge sneakers only available in small shoes size. Be the first to get the perfect size. If you are looking for the latest style on small size, this is the best place to capture the trend. All our new shoes show up here and it is available in size 32, size 33, size 34, size 35 and size 36 on arrival. MZ knows how difficult it is to get a pair of nice pump for petite feet from size 32 to size 35. Here all heights are available for petite lady: high heel, mid heel, kitten heel, and platform. They are feminine, glamourous, classic, or elegant for all occasions. They are particularly chosen for delicate small feet in the result of a better supportive fit and more secured maintain. 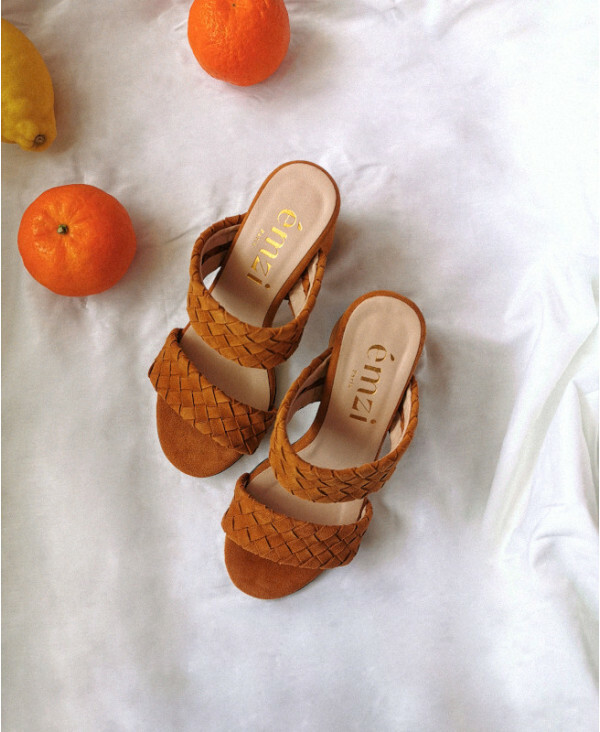 MZ sandals will offer all small feet a cool fresh summer. All designs are easy to style and comfortable to wear. They can be casual, chic, or cool to walk in for working routines or laid-back holidays. Small sizes are available from size 32 to size 36. 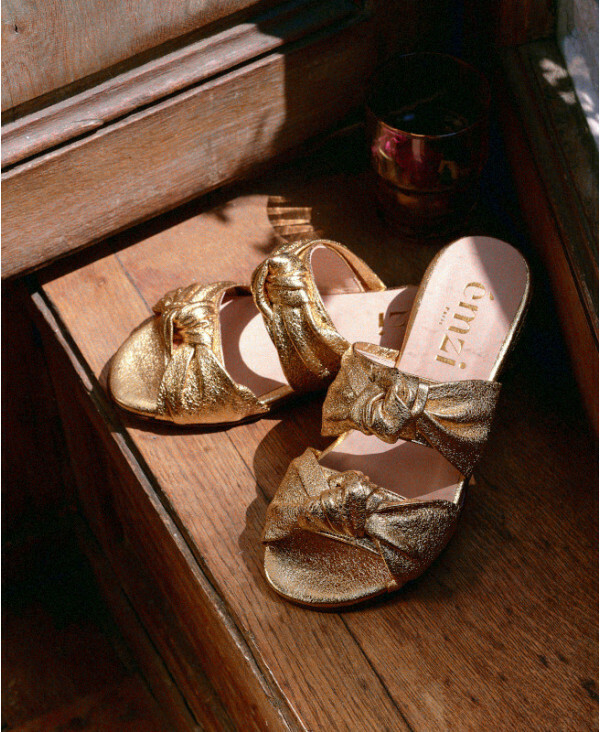 Flat shoes are must-haves for all ladies. MZ flat shoes focuses on comfort, quality and design for small feet. Petite women will be able to show personality with our modern looks. There are quality guaranteed derbies, brogues and loafers from size 32 to size 36. MZ sneakers offers a sport chic looks to all petites fashionistas. 100% hand crafted in Italy, our sneaker selection are made from quality leather and also entirely leather lined inside for the best comfort and a better durability. The secret of our sneaker is, there is a invisible heel inside that provides the necessary height without compromising the on style. They are classic, chic, and comfortable for your casual look. MZ boots provides not only the small sizes 32 33 34 35 36 but also the quality and style in one go. Made in Spain or Italy with fine leather, the boots are comfortable to wear and complement perfectly all autumn winter outfits and make the neutral tone dressing to be elegant and fashion. Suede wedge sneaker A classic black and white sneaker made from suede set on a matching stripped rubber sole. A must have item for every girl. An invisible wedge inside provides the perfect lift for petite. Handmade in Italy Material: lambskin suede Sole: micro foam & rubber sole Color: black Height: approximately 50mm Availability : E-shop. Classic lamé suede pump Chic yet luxurious. A pointed toe pump made in Spain from nice bronze lamé leather. 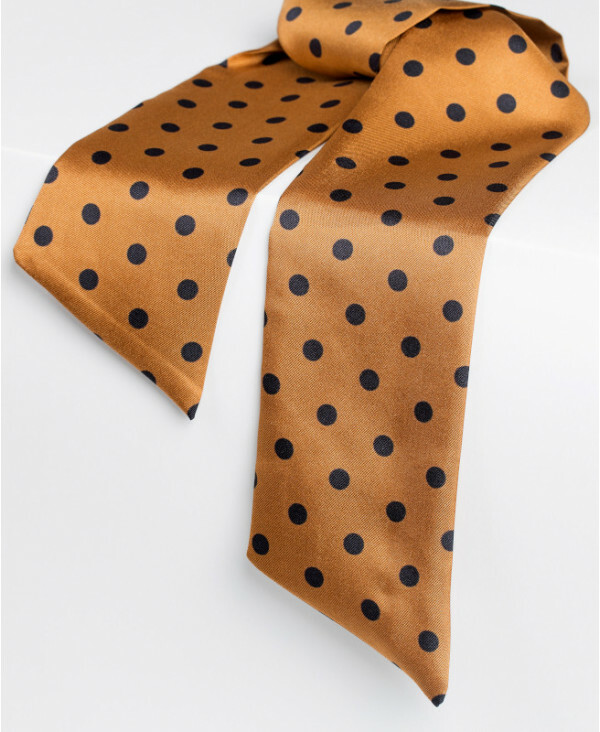 It is easy to wear and style. Handmade in Spain Material: lame leather Sole: synthetic flexi sole Colour: bronze Height: approximately 80mm Disponibility: E-shop. Classic lamé suede pump It shines like a star on your petite feet. A pair of pretty stiletto to sublime your look. Don’t hesitate, be the star! Handmade in Spain Material: lamé leather Sole: synthetic flexi Colour: red Height: approximately 80mm Availability: E-shop. Lace tie velvet mary jane pump Fall in love at the first sight on our Giulia Velvet. The perfect pump to have for a feminine look with its rich burgundy tone and its pretty tie strap. Handmade in Italy Material: velvet & lambskin leather Sole: soft rubber Colour: burgundy Height: approximately 50mm Availability: E-shop, Shop in Paris. Velvet classic pump with heart detail Bring the warm touch to the cold days with our Cara, a nice burgundy hue pump made from luxurious velvet with heart detail. Handmade in Italy Material: velvet & lambskin suede Sole: soft rubber Couleur: burgundy Height: approximately 50mm Availability: E-shop, shop in Paris. Leather classic pump with heart detail A graceful touch to complete our outfit, Cara Candy is made from fine lambskin leather in Italy. The heart decoration warm us up in the winter days. Handmade in Italy Material: lambskin leather nappa Sole: soft rubber Colour: pink Height: approximately 50mm Availability: E-shop, Shop in Paris. Two tone leather wedge sneaker Feel free with our Power Candy, a pair of light weight sneaker with invisible heel inside for a perfect lift. Handmade in Italy Material: lambskin leather nappa Sole: micro foam & rubber Colour: white & pink Height: approximately 50mm Availabilty: E-shop. Two tone leather wedge sneaker A new look in our wedge sneaker collection, with its little invisible heel inside. The contrasting black and red tone sneaker add the bold edge to any casual outfit in cold days. Handmade in Italy Material: lambskin leather nappa Sole: micro foam & rubber Colour: black & red Height: approximately 50mm Availability: E-shop. Studded suede brogue Classic brogue with studs decoration in velvety suede. This flat shoe in timeless dark blue is a must have for daily routine. Handmade in Italy Material: lambskin suede Sole: soft rubber Colour: dark blue Height: approximately 20mm Availability : Shop in Paris. Studded patent brogue Feel proud to show this pair of brogue with lacquered burgundy tone. The chic and trendy choice for both casual or elegant outfit. Handmade in Italy Material: patent lambskin leather Sole: soft rubber Colour: burgundy Height: approximately 20mm Availability: Shop in Paris. Zebra print loafer with knot detail A contemporary update on a classic loafer silhouette. This 40mm pump is entirely hand made in Italy from calf hair leather and suede. Handmade in Italy Material: calf hair leather & lambskin suede Sole: soft rubber Colour: zebra print Height: approximately 40mm Disponibility: E-shop, Shop in Paris. Suede fringe loafer pump A classic squared toe loafer pump with fringe detail. The Italian made shoe is finished in ultra soft suede in dark blue, perfect versatile shoe to go for any occasions. Handemade in Italy Material: lambskin suede Sole: soft rubber Colour: dark blue Height: approximately 50mm Disponibility: E-shop, Shop in Paris. Patent fringe loafer pump A low block heel with classic Italian fringe detail at front. This burgundy lacquered pump comes with slightly cushioned insole for the comfort. Handmade in Italy Material: patent lambskin leather Sole: soft rubber Colour: burgundy Height: approximately 50mm Disponibility: E-shop, Shop in Paris. Double strap leather mary jane pump A glamourous update on classic mary jane. 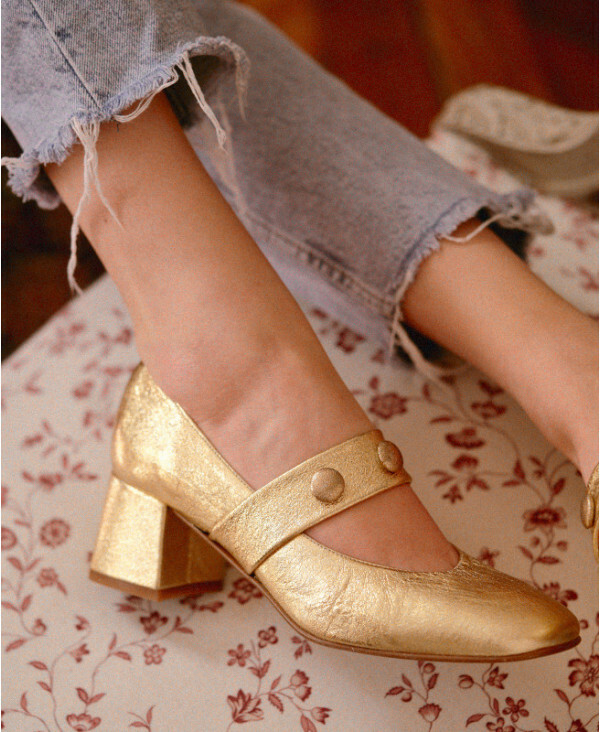 The Spanish made gold pump features double straps and is set on a block heel. Handmade in Spain Material: leather Sole: synthetic flexi Colour: gold Height: approximately 65mm Disponibility: E-shop. Double strap patent mary jane pump A retro chic mary jane reimagined in patent leather in black. 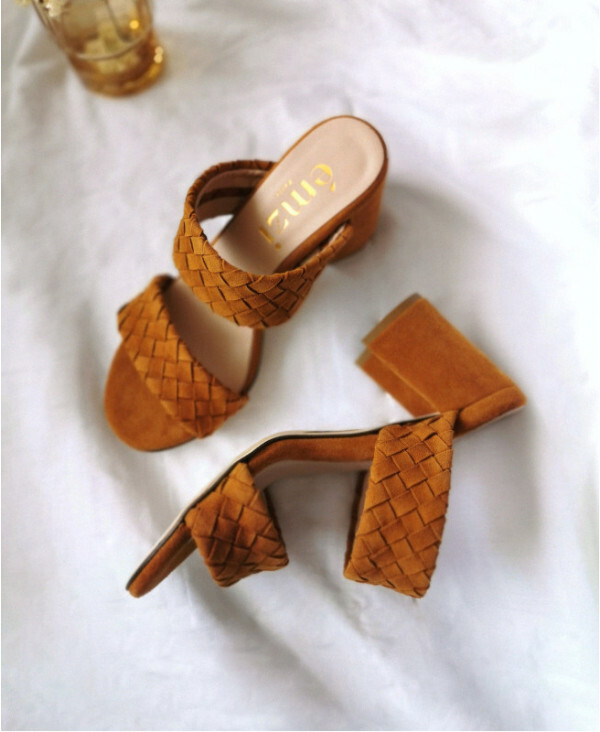 The sturdy block heel and double strap secure all moves. Handmade in Spain Material: patent leather Sole: synthetic flexi sole Colour: black Height: approximately 65mm Disponibility: E-shop. 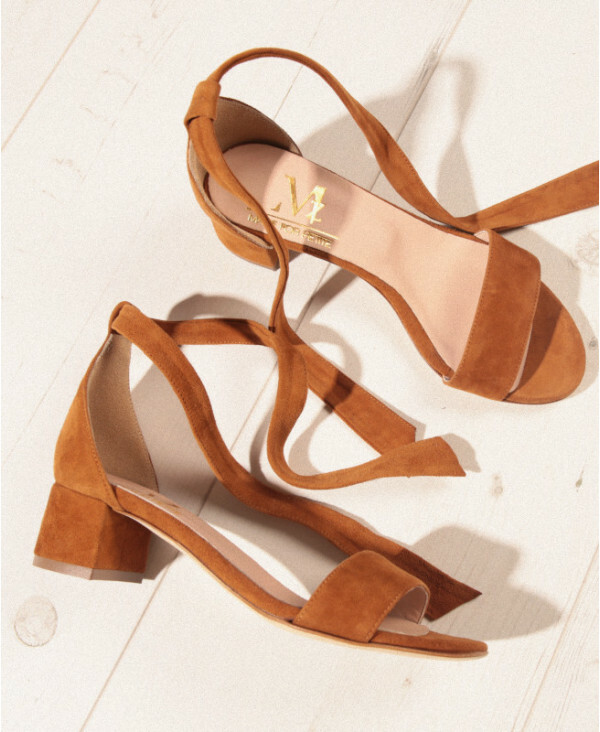 Jewel suede pump The jewel stiletto every girl loves. Fin heel, smooth suede and smoky crystal, show your elegance with our Ariana. Handmade in Spain Material: suede Sole: synthetic flexi Colour: dark blue Height: approximately 85mm Disponibility: E-shop, Shop in Paris. Jewel tweed pump Forever jewel, timeless stiletto heel, all perfectly merged into this shoe. Adopt this tweed version and feel like a princess. Handmade in Spain Material: fabric & leather Sole: synthetic flexi Colour: tweed print Height: approximately 85mm Disponibility: E-shop.